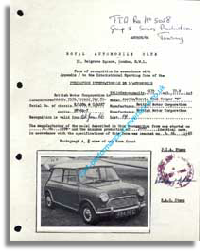 A full set of the homologation papers for the original, and arguably the best of them all, the 850cc MK1 Austin Mini. Both Austin & Morris versions were homologated seperately. Sorry about the poor quality of the copies, you can thank the FIA for this! Submitted to the FIA 16th January 1962. The homologation papers for a Rally or Race car give all the details of exactly which modifications are and are not allowed. The detail in these papers is obsessive and everything down to the last nut or bolt is measured, recorded and approved. 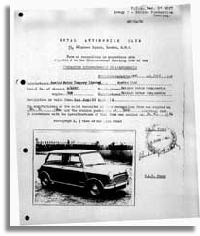 This is a complete copy of the first ever set of Homologation papers submitted to the FIA that referred to the "New" BMC Mini Cooper S. It is interesting to note that the papers are submitted by BMC in association with The Cooper Car Co. Thanks to Hannu Laakso for the copy. Submitted to the FIA January 1966 (Gp. 1). The full set of homologation sheets for the 998 Cooper. In Group 1 Racing trim. Thank you to Christian from Switzerland for submitting these very interesting papers. 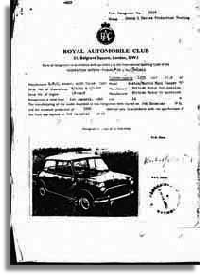 970cc Cooper 'S' Homologation Papers. 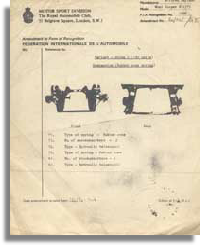 Submitted to the FIA 11th April 1964 (Gp. 2). 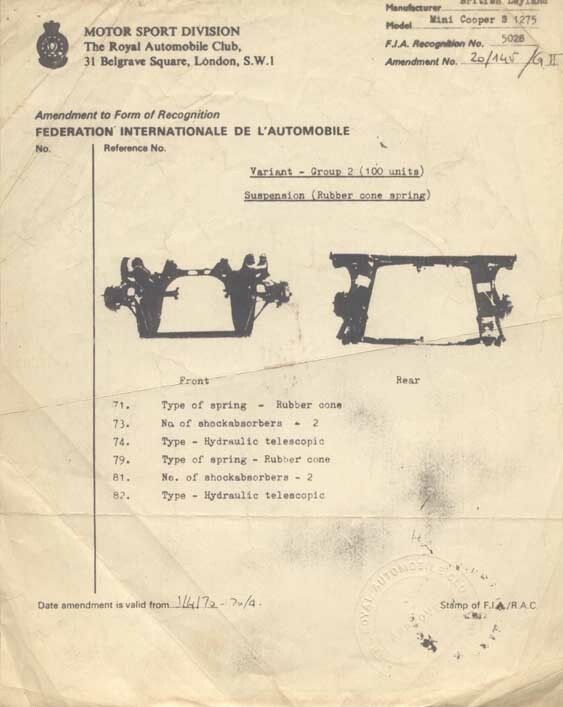 The full set of homologation sheets for the 970 S. The homologation papers for a Rally or Race car give all the details of exactly which modifications are and are not allowed. The detail in these papers is obsessive and everything down to the last nut or bolt is measured, recorded and approved. 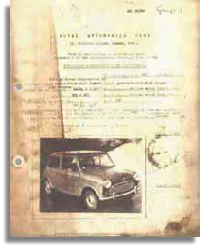 1275cc Cooper 'S' Homologation Papers. Submitted to the FIA 11th April 1964. Submitted to the FIA 1st Jan 1966. 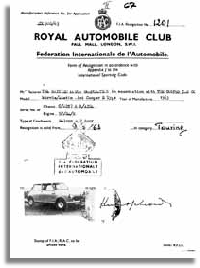 The first sheet of the homologation form for the 1275 cc. Mini Cooper 'S' . This second version is the papers under the "new" Appendix J that ran from 1.1.66. to 31.12.81. (ie. the Appendix J ran for that period, homologation of the S expiring, as for all cars then, at the end of the fifth year after production ceased). 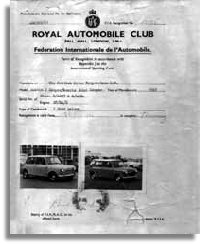 1275cc Cooper S Homologation Papers. Submitted to the FIA 1970. The most complete set of homologation papers ever compiled. The third version is a set including all Amendments to 1970. The papers themselves were not "submitted" or "approved" in 1970 but anyone purchasing a set then would receive them with all the Amendments to that date. As far as I can recall, this set includes all the Amendments ie. there were no later ones issued. Thanks to Ben Tebbutt for sending me this copy. FIA. 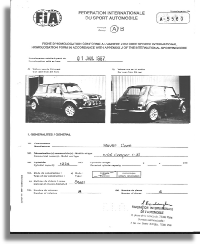 5405 Homologation for Mini Clubman 1275GT. Submitted to the FIA October 1970. 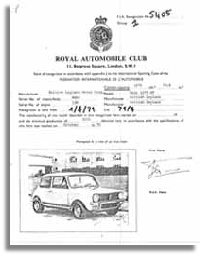 A complete set of homologation papers for the 1275 GT Mini Clubman. 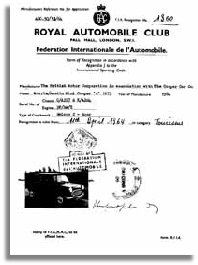 Rover Cooper SPI Homologation Papers. Submitted to the FIA 1st Jan 1994. A bit out of the remit of most of the forum, but for the sake of completeness here is a copy of the papers for the SPI Cooper. 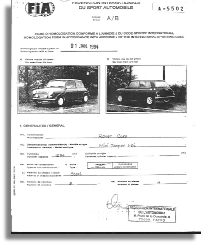 Rover Cooper MPI Homologation Papers. Submitted to the FIA 1st Jan 1997. A bit out of the remit of most of the forum, but for the sake of completeness here is a copy of the papers for the MPI Cooper. 1970 Homologation Variation Cylinder Head. 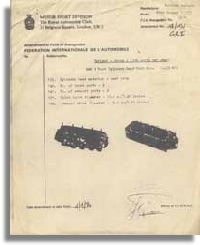 This excemption form notifies the FIA of the addoption of the 12G940 cylinder head c/w 29mm exhaust valves for use with the Cooper S. All previous S heads had used the 31mm exhaust. The "Weslake" 8 port head. 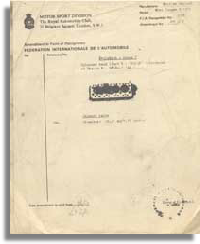 Submitted to the FIA April 1970. 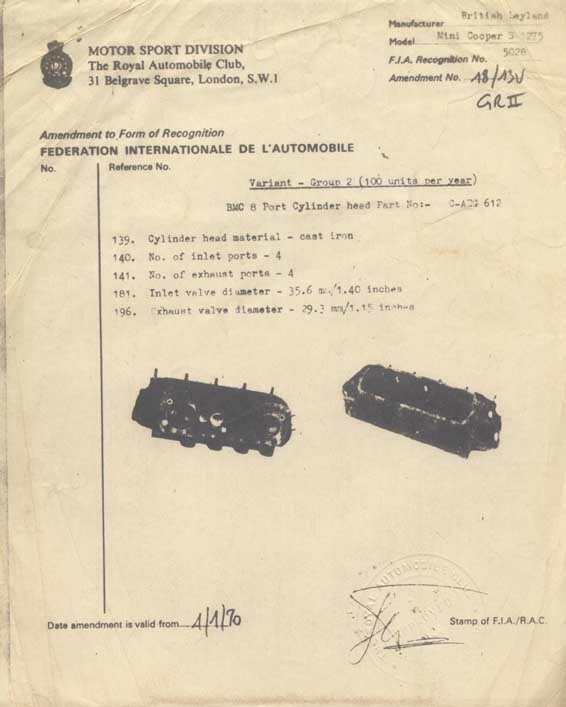 The head was first homologated in 1970 and heres the sheet that proves it. Rubber Suspension on Cooper S.
The rubber suspension system was homologated for use on the Cooper S after the Competitions department had struggled to get the Hydrolastic system working for most of the 1960's. 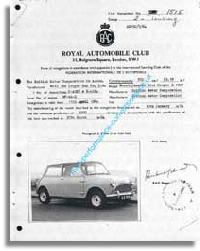 A collection of Homologation papers relating to the Mini, Mini Cooper, Cooper S & Rover Cooper. 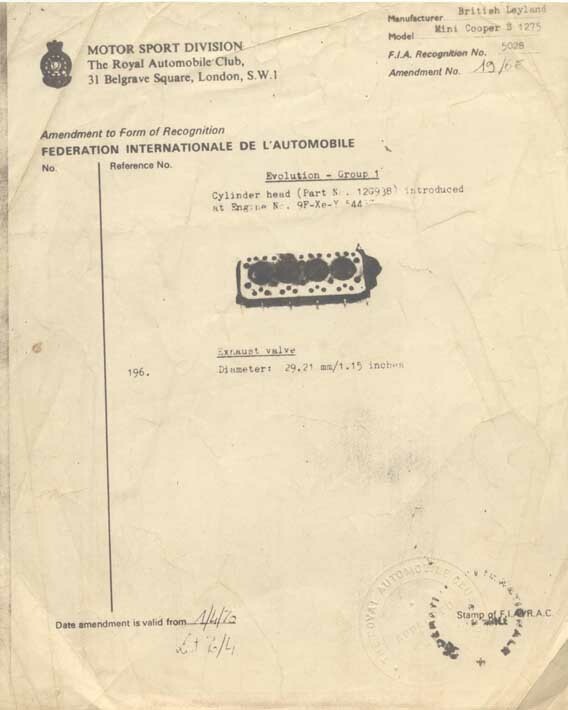 This section is now redundant & will no longer be updated as the FIA have updated their archive & have made all historic Homologation papers & a wealth of other historic information free to access on line. 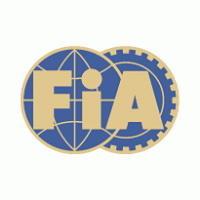 Check out this fantastic archive by clicking the FIA logo below.